Most eye surgeries, including LASIK, carry risk of cataracts. Anecdotal reports of cataracts shortly after LASIK, even in relatively young patients, suggest a cause and effect relationship. Moreover, steriod drops routinely prescribed after LASIK may hasten the onset of cataracts. Patients with signs of cataracts before LASIK should not have LASIK because vision may be corrected with the intraocular lens used for cataract surgery. Ironically, after LASIK the altered corneal surface causes inaccurate measurement of the intraocular lens power for cataract surgery. This means that patients who have LASIK surgery and later develop cataracts may be right back in glasses after cataract surgery -- or worse, subjected to the inherent risks of multiple surgeries. What should you do if you have had LASIK? Print this form (K-card) and have it completed by your LASIK surgeon, and then place it with your important records for safekeeping. Do not delay, as medical records may be destroyed after five years in some states. Read more about the importance of the K-card below. Facing cataract surgery after LASIK? Request your LASIK medical records from the surgeon (alternatively, you can print this form (K-card), and have it completed by your LASIK surgeon) and take them with you to the cataract surgeon. WARNING: Do not fall for the marketing hype surrounding "multi-focal", "accomodating", or "premium" intraocular lenses. Patients who have previously undergone RK or laser eye surgery may not be happy with their vision with these so-called "premium lenses". The cataract surgeon may try to UPSELL you a premium lens to put more money in his pocket, but you may be happier with a conventional cataract lens. If you developed early cataracts after LASIK, or if you experienced a bad outcome from cataract surgery due to prior LASIK surgery, you should file a MedWatch report with the FDA online. Alternatively, you may call FDA at 1-800-FDA-1088 to report by telephone, download the paper form and either fax it to 1-800-FDA-0178 or mail it to the address shown at the bottom of page 3, or download the MedWatcher Mobile App for reporting LASIK problems to the FDA using a smart phone or tablet. Read a sample of LASIK injury reports currently on file with the FDA. Kasım B, Koçluk Y, Burcu A. Interface fluid syndrome secondary to endothelial failure due to toxic anterior segment syndrome after cataract surgery. Eur J Ophthalmol. 2018 Sep 11:1120672118800241. doi: 10.1177/1120672118800241. A 52-year-old woman, complaining blurred vision in her right eye for 18 months after cataract surgery, was referred to our clinic. She was diagnosed with toxic anterior segment syndrome, postoperatively, which resolved in 3 days. She had a history of laser in situ keratomileusis surgery 15 years ago. Slit-lamp examination of the right eye showed corneal haze, limited to laser in situ keratomileusis flap. The patient was diagnosed with interface fluid syndrome secondary to endothelial decompensation due to toxic anterior segment syndrome. Descemet's membrane endothelial keratoplasy was performed along with full thickness fenestrations in the laser in situ keratomileusis flap to the right eye of the patient. The fluid was resolved in 1 week and visual acuity was improved rapidly. This case shows the importance of considering the diagnosis and determining the specific etiology of interface fluid syndrome, even years after the laser in situ keratomileusis surgery, when endothelial cell function has been compromised with any factor, such as intraocular surgery and its complications. Editor's note: This woman's relatively young age at the time of cataract surgery (50 - 51) suggests a causal relationship to previous LASIK surgery. A 36-year-old female presented with blurring of vision since 1 year after having undergone an uneventful LASIK surgery 3 years prior. Corneal topography and aberrometry were within normal limits. Although the lens was morphologically normal on slit lamp examination, increased HOAs and lenticular density were detected. Since there were no cataractous changes, the patient was advised regular follow-up. A year later, the patient had developed lenticular changes along with a further increase in aberrations and worsening of scatter on densitometry... This report shows how preclinical cataract can mimic post-LASIK regression with a change in spherical and cylindrical power of the eye. This could result in patients undergoing re-correction in eyes where the primary pathology is in the lens. Source: Shetty et al. Preclinical cataract masquerading as post-LASIK regression. Oman J Ophthalmol. 2016 Sep-Dec;9(3):157-159. Yesilirmak et al. The Effect of LASIK on Timing of Cataract Surgery. J Refract Surg. 2016 May 1;32(5):306-310. To compare the age at the time of cataract surgery in patients who have undergone microkeratome-assisted LASIK versus individuals matched for axial length, cataract grade, and visual acuity with no history of refractive surgery. Retrospective chart review of patients who underwent cataract extraction between September 2013 and March 2015 at the Bascom Palmer Eye Institute. Patients had a history of either microkeratome-assisted LASIK or no prior ocular surgery. Corrected distance visual acuity (CDVA) before and after cataract extraction, uncorrected distance visual acuity (UDVA) before cataract extraction, gender, axial length, and cataract grade were assessed, along with age at the time of LASIK, age at the time of cataract extraction, and the time lapse between LASIK and cataract extraction. Fifty eyes of 38 patients were included in the LASIK group and 155 eyes of 136 patients were included in the control group. There was no significant difference between these groups with respect to gender (P = .87), CDVA before cataract extraction (P = .11), UDVA before cataract extraction (P = .09), axial length (P = .67), and cataract grade (P = .46). Mean age at the time of cataract extraction for patients in the LASIK group and control group were 64 ± 7 and 73 ± 8 years, respectively (P < .005). Negative correlations were found between age at time of cataract extraction and axial length in the LASIK and control groups (r = -0.18, P = .20 vs r = -0.36, P =. 01, respectively). Microkeratome-assisted LASIK seems to be correlated with earlier cataract extraction. Patients with a history of microkeratome-assisted LASIK under-went cataract surgery a decade sooner than patients with similar demographic and ocular characteristics. Manning et al. Cataract surgery outcomes in corneal refractive surgery eyes: Study from the European Registry of Quality Outcomes for Cataract and Refractive Surgery. J Cataract Refract Surg. 2015 Nov;41(11):2358-65. Cataract surgery clinics in 18 European countries and Australia. Cases of cataract extraction with corneal refractive surgery eyes (corneal refractive cases) were identified from all cataract extractions reported to the European Registry of Quality Outcomes for Cataract and Refractive Surgery database over a 5-year period. Preoperative and postoperative measurements and trends over time were analyzed. Of 807,220 cataract extractions, 1229 (0.15%) were corneal refractive cases. There was a significant increase, over time, in the number of corneal refractive cases (P < .001). Corneal refractive patients were younger than patients without corneal refractive surgery (nonrefractive patients) (62.9 years versus 74.0 years; P < .001) but had similar mean preoperative and postoperative corrected-distance visual acuity (CDVA) (preoperative logMAR 0.44[6/16] for both [P = .286]; postoperative logMAR 0.06[6/7] for both [P = .245]). Postoperative CDVA was worse than preoperative CDVA in 35 (4%) corneal refractive and 8,999 (1.5%) nonrefractive patients (P < .001). In all, 74 (8.5%) of 873 corneal refractive versus 16,566 (2.8%) /584,496 nonrefractive patients, having cataract surgery, had preoperative CDVA of logMAR 0.0[6/6] or better (P < .001). Nineteen (54.3%) of 35 corneal refractive case patients who had worse postoperative CDVA had preoperative CDVA of logMAR 0.0(6/6) or better. Cataract surgery has been reported with increasing frequency in corneal refractive surgery patients, since 2008. These patients had preoperative CDVA similar to those of patients without previous corneal refractive surgery but were younger and were at higher risk of worse postoperative CDVA, especially if they had preoperative CDVA of logMAR 0.0(6/6) or better. Iijima et al. Demographics of patients having cataract surgery after laser in situ keratomileusis. J Cataract Refract Surg. 2015 Feb;41(2):334-8. "In conclusion, in this study, patient age at the time of cataract surgery in the post-LASIK cataract group was approximately 10 years younger than in the AL-matched group, and approximately 15 years younger than in the whole population." The table below shows the average age of post-Lasik patients undergoing cataract surgery (group 1) of 54.6 years, average age of patients with axial lengths matching the post-Lasik eyes undergoing cataract surgery (group 2) of 63.9 years, and the average age of all cataract surgery patients (group 3) of 71.1 years. 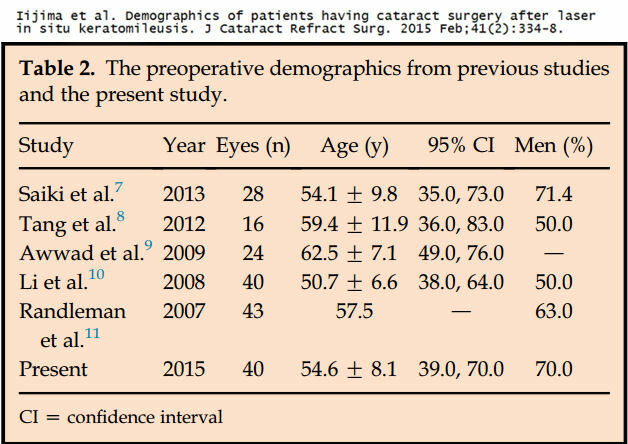 The table below shows the age of patients having cataract surgery after LASIK in this study and five previous studies, with a weighted average age of 55.8 years. This is 15.3 years younger than the average age in Group 3 of the entire study population of cataract patients. A letter with 126 signatures of concerned citizens was sent to the FDA on 11/2/2009 asking the agency to issue a LASIK Public Health Advisory. From the letter: "As stated, LASIK surgery results in miscalculation of lens implant power for future cataract surgery. In 2008, the FDA announced on its web site that it had "worked with the American Academy of Ophthalmology to develop a card that physicians can fill out with the patient's eye measurements before their LASIK surgery." Unfortunately, LASIK surgeons do not routinely provide patients with a K-card. Retention of medical records by healthcare providers is required by state laws; however, in many states medical records may be destroyed after five years. The majority of LASIK patients in the United States are not aware of the need to obtain their pre-LASIK eye measurement records. Therefore, it is incumbent upon the FDA to include this information in a public health advisory concerning LASIK eye surgery." The FDA never acknowledged receipt of the letter, and has continued to ignore this important public health issue. There is really only one reason why LASIK surgeons fail to provide patients with a K-card, and that is because alerting patients to the consequences of having LASIK is bad for business. LASIK surgeons don't seem to care what happens to their patients in the future. To investigate the timing of cataract extraction in patients with a history of prior corneal refractive surgery (LASIK/PRK) and to compare with a group of age-matched controls. To compare the visual acuity (BCVA) at the time of cataract evaluation between both groups to determine if these patients are potentially more sensitive to changes in vision (reflecting higher visual demands). To assess whether LASIK influences timing of subsequent cataract surgery. Age and surgical history were captured on 436 cases of cataract surgery from September 2013 to September 2014. 25 cataract patients (5.7%) had a prior history of LASIK/PRK surgery (LASIK group) and 411 age-related cataract patients (94.3%) had no history of LASIK/PRK (non-LASIK group). The non-LASIK group had an average age of 69.34 +/- 11.19 years while the LASIK Group had an average age of 62.96 +/- 7.64 years. The difference between these two groups is statistically significant (t(434), 2.811, p=0.005). The non-LASIK group had a pre-op BCVA of 0.326 +/- .314 (20/42) and the LASIK group had a pre-op BCVA of 0.299 +/- .160 (20/40). The pre-op BCVA for these two groups was not statistically significantly different (t(238),0.283, p=0.777). Cataract progression after LASIK is not very rapid but significantly earlier then age related cataract progression. Since pre-op BCVA of both groups are not significantly different, hypothesized increased sensitivity to visual decline in post-LASIK patients is eliminated in the interpretation of the results. The mechanism of the effect of LASIK on lens status remains unclear. Moshirfar et al. Age of cataract extraction in post-refractive surgery patients. J Cataract Refract Surg. 2014 May;40(5):841-2. Quote from the full text: "In conclusion, the mean age of cataract extraction in patients who have had refractive surgery is younger than in patients with no previous refractive surgery." I had Lasik surgery in both eyes in 2008, had to have an enhancement in my left in 2013. My annual check up was this week and my eye doctor noted I now have cataracts developing in both eyes that were not there in 2009, 2013 before my enhancement or any of my checkups. I have development in the 6 yrs since my initial lasik. I am [redacted] with no previous history of cataracts or medical reason for them to develop. From the article: Mr. Colin Sim wanted to correct his vision with cataract surgery, but was left seeing double instead. He had undergone a LASIK procedure 10 years ago, but the cataract surgeon failed to factor this in, he said. "Also, because LASIK devices change corneal shape, the risk of a poor outcome from cataract surgery is increased. Most people who have LASIK will require cataract surgery later in life and the surgeon's measurements of post-LASIK corneas to calculate the appropriate intraocular lens (IOL) power will likely be inaccurate." "To improve outcomes following future cataract surgery, FDA has partnered with the American Academy of Ophthalmology (AAO) to develop a patient card detailing the patient's preoperative corneal measurements, which are important in determining the power of the implanted intraocular lens." IOL power selection is not as accurate on post-LASIK eyes as on unoperated eyes, even using the preoperatiave corneal measurements. Moreover, virtually no LASIK provider gives the card to patients because doing so would alert patients to long-term consequences of LASIK, which were not disclosed prior to surgery. I had LASIK surgery on both eyes in [redacted by FDA] 2012. By [redacted by FDA] 2013, the sight in my left eye began to greatly deteriorate and my LASIK surgeon performed an enhancement that did not work. I began experiencing cloudiness and pain in my left eye. When I went back he told me that I had an aggressively growing cataract in my left eye. I am only [redacted by FDA] and I am scheduled to have the cataract in my left eye removed next week, I have also suffered from extreme dry eye since the LASIK surgery. I am extremely disappointed that this was not mentioned as a possible complication from the LASIK surgery. Had I known I could possibly develop cataracts, I would not have elected to have the LASIK procedure. I had Lasik surgery the summer of 2009 at age 45. I was considered a good candidate for the surgery. I had very good vision (20/15) for almost 2 years, but then started noticing changes. My regular eye doctor thought that I was simply suffering from dry eye. After about 8 months of treatment, the doctor could see cataracts forming. I just had cataract surgery on my left eye Feb 26, 2014 at age 50, only 2-1/2 years after noticing the first vision degradation. The cataract was rated 3+. This cataract caused blurring and multiple images, rather than cloudiness or discoloration. I also have a cataract forming in my right eye, though it isn't progressing as aggressively as the left eye did. I do not have any health issues such as diabetes, I never took steroids except for the eye drops after Lasik surgery, and I have never had any type of eye injury which would cause early cataracts. I believe that the Lasik surgery or follow-up eye drops caused me to develop early, aggressive cataracts. I underwent LASIK surgery around 1999. A few years later, I was diagnosed with a cataract in my left eye. I put off cataract surgery as long as possible; and now at age [redacted by FDA], I have cataracts in both eyes. My vision is so affected that I have fallen several times because I could not see objects on the floor in nighttime lamp light. To make matters worse, my cataract surgeon explained that the cataract surgery will be difficult because the medical equipment used to determine the refraction needed in the replacement lens uses a ratio of two surfaces in a non-LASIK eye. Thus, the surgeon will have to use other formulas and manually determine what strength the implanted lens should be basically, he will have to guess. If LASIK surgery is going to be performed w/o telling patients that early cataracts are more likely to develop, at least tell the patients to keep a copy of their LASIK surgical records so that subsequent cataracts surgery can be performed w/o "estimating" or guessing what replacement lens is needed to restore sight. Lasik surgery done to correct a nearsighted vision problem in 2003, with a touch up done in 2004. Within a couple of years diagnosed with cataracts in both eyes. Just completed cataract removal in one eye with mixed results. Still need removal of cataract in right eye. Suspect original LASIK surgery performed at [redacted by FDA] as cause and effect of cataracts at such a young age. Better warnings and public awareness are needed to fully inform pts. Cataracts were never listed as an increased possibility at the initial surgery by [redacted by FDA]. I suspect I will need yet another eye surgery to again correct my vision, as less than desired results have happened with the removal of the left cataract. I had LASIK surgery approximately 12 years ago and now must undergo cataract surgery. I am all of [redacted by FDA], which is relatively young for this type of surgery. My ophthalmologist attributes this to the LASIK, though he cannot definitively confirm it. Lasik surgery approximately year 2000. In 1999, at the age of [redacted], I had LASIK eye surgery. One year later, I was back in contacts and had developed cataracts in both eyes. In 2000, although the eye doctor could identify my cataracts in both eyes, it did not affect my vision. That changed in 2012 and now at the age of [redacted], I need to have cataract surgery. I do not have a family history of cataracts. Both of my parents over the age of [redacted] have not had any signs of cataracts. Lasik was performed by [redacted]. I had LASIK SURGERY on both eyes Dec. of 2006. I now have cataracts in both eyes and have been informed that the surgery I had complicates the correction of cataracts for me. Also I am not a candicate for the latest IOL implants because of the lasik surgery. I am very upset at this point, and had I been informed of this prior to the surgery I would have never had the lasik surgery at all. I have also had very dry eyes ever since the surgery. I was told that I was a good candicate for the surgery and that the dry eye thing would not be a problem for me. This is extremely upsetting and patients should be informed in detail about this cataract situation. I think it would change a lot of minds to learn that the lasik thing can and usually does cause the cataracts and that this is difficult if not impossible to correcct without returning to glasses all over again. And I paid for lifetime enhancements and the Institue where the surgery was performed closed down and is gone. This is terrible to discover also. I have contacted them several times in the past few months, thinking that my vision problems were calling for enhancements ( the closest institute is in another state) and have been told evry time someone will get back with you, and they never have. I am thinking about seeing a lawyer concerning this part, because I was ripped off and they should have to refund my part paid for enhancements. I encourage anyone considering this surgery to think twice and more, it isn't worth it. I was better off wearing my contacts and glasses. I had LASIK surgery for correction of shortsightedness. I did not realize if I was informed that I would need the preoperative measurements for subsequent cataract surgery. Now I am told this is a legal requirement from the Dr., but he says the files are too difficult to retrieve and it is being done safely without. The surgeon I now see says there are limitations without these measurements and I am afraid to proceed. Is it possible to legally demand my records? Is the LASIK company required to maintain these records also? I see nothing about this problem on any forums or where I can get better info. I feel people are not truly aware of such difficulties in this subsequent but necessary and common surgery. Can you help me in any way? Excerpt: The DLS technique will now assist vision scientists in looking at long-term lens changes due to aging, smoking, diabetes, LASIK surgery, eye drops for treating glaucoma, and surgical removal of the vitreous gel within the eye, a procedure known to cause cataracts within six months to one year. It may also help in the early diagnosis of Alzheimer’s disease, in which an abnormal protein may be found in the lens. In addition, NASA researchers will continue to use the device to look at the impact of long-term space travel on the visual system. "I had lasik on both eyes in 2001. The first result was not good and i had one enhancement of my left eye and twice on my right eye. The right eye was still not fully corrected. In 2006, a regular eye exam found cataract in both of my eyes. It was worse in my right eye. In 2008, i had a cataract surgery for my right eye. I will have another surgery on my left eye at a later date. One of the eye doctors i have seen thought my cataract might be related to the lasik. If lasik could cause such side effect, this surgery should be prohibited or at least the dr should certainly let patients know the risk." "I had lasik surgery on both eyes in 2003. My eyes were burnt red for 4 months. I had pressure in the right eye. At first the vision was fine - now i have cataracts that my physician said was caused by the lasik surgery. I went to a different dr and had the cataract removed on my right eye and now i still have to wear glasses because they could not correct the vision with the lens put in for the cataract surgery. I wish i would have never had lasik because now my eyes are ruined, and i have to wear glasses again." From the article: There has been a question of whether laser refractive surgery is accelerating the development of cataract. This is controversial, but I see it more and more often in my practice," he said. Dr. O'Brien is professor of ophthalmology and director of the Refractive Surgery Service, Bascom Palmer Eye Institute, Miami... "These patients who develop cataract after refractive surgery want a perfect outcome. They are potentially frustrated and angry because their quality of vision has suffered as the result of the refractive surgery, and the results may be unpredictable. Interestingly, incorrect power is the most common reason for IOL explantation. This is the result of our not being able to determine the power as accurately as we would like," he stated and advised exercising extra care with these patients. Post 1: "Hello. At this moment, I am three months post lasik. One month after the procedure, I developed cataracts in both eyes. They WERE NOT there before the surgery. I have read other cases where cataracts developed quickly after lasik surgery, though the medical profession will not account that lasik caused this. I am 23 years old. I am taking no medication. I do not have any other explanation to why my cataracts developed besides the lasik procedure. The likelyhood is just too great." Post 2: "Immediately prior to my LASIK surgery in February 1999, my eyes were examined by an ophthalmologist and an optometrist in my pre-op appointments. Both pronounced my eyes to be very healthy, just very myopic. I was -13.5 right and -14.5 left. Nobody suggested that I might be at a higher risk for complications due to the severity of my nearsightedness. The surgery was uneventful. Immediately afterwards my eyes became very dry, and my vision began to get increasingly worse, like I had Vaseline in them. The opthalmologist was concerned and had me return for frequent follow-up visits. He had me continue taking 4 drops of FML, a topical steroid eyedrop, for 6 weeks to combat the dry eyes and in hopes of improving the vision. At each visit my best corrected vision declined until at 6 weeks I was about 20/100 in both eyes. It was at this visit that the doctor found small posterior subcapsular cataracts in both eyes--dead center where the laser would have worked. We were all shocked. Both doctors confirmed (one in writing) that the cataracts were not there before LASIK. I was 39 years old then, had no family history of cataracts or other risk factors for cataracts, and had never used steroids except for the 4 drops of FML for 6 weeks." This was posted by an ophthalmologist in response: "On many different threads I have repeatedly brought attention to the alarming frequency of cataracts arising shortly after LASIK or PRK. The point that I have been unsuccessful in bringing across is that, if you suspected you would need cataract/implant surgery to begin with, you would never have LASIK or PRK because cataract/implant surgery can itself correct all refractive errors and even astigmatism to a large extent. To repeat, these cataracts have been reported again and again in relatively young customers who have taken no or innocuous doses of steroids." Case Report Ophthalmol. 2012 May;3(2):262-5. Cataractogenesis after Repeat Laser in situ Keratomileusis. Department of Ophthalmology, American University of Beirut, Beirut, Lebanon. Abstract: There has been the unsubstantiated clinical impression that laser refractive surgery accelerates cataract development along with solid experimental data about the cataractogenic effects of excimer laser treatment. We present the first documented case of significant cataract formation in a young myope after repeat excimer laser ablation necessitating phacoemulsification with a posterior chamber implant. Proposed explanations include focusing of the ablation wave on the posterior capsule (acoustic wave lens epithelial damage), photooxidative stress of the lens (ultraviolet and inflammatory oxidative stress), and corticosteroid-induced cataract (lens toxicity). Am J Ophthalmol. 1999 Oct;128(4):507-9. Nakamura K, Bissen-Miyajima H, Arai H, Toda I, Hori Y, Shimmura S, Tsubota K.
METHOD: Case report. A 44-year-old man was initially seen with a traumatic cataract, corneal stromal opacity, and defect of the endothelium in the right eye after laser-assisted in situ keratomileusis performed by a plastic surgeon who had no ophthalmologic training. RESULTS: It was speculated that repeated ablations resulted in corneal perforation. We immediately performed phacoemulisification to remove the cataract and to prevent phacolytic glaucoma. However, visual acuity remained 20/200 because of the corneal stromal opacity, and penetrating keratoplasty was performed 2 months later, which improved best-corrected visual acuity to 20/30. CONCLUSIONS: This case demonstrated that laser-assisted in situ keratomileusis can cause devastating damage to the eye. Krueger RR, Seiler T, Gruchman T, Mrochen M, Berlin MS.
PURPOSE: To determine the stress wave amplitudes generated during photoablation of the cornea using an argon fluoride excimer laser. DESIGN: Experimental study using porcine eyes. METHODS: Profiles of the stress wave amplitudes and enucleated human eyes along the axis of symmetry of porcine eyes and enucleated human eyes were measured using a miniature piezoelectric transducer. The ablation parameters, fluence, and ablation diameters were varied within the range of clinical application. MAIN OUTCOME MEASURES: Stress wave amplitudes generated during photoablation. RESULTS: The stress waves pass through a pressure focus located in the posterior lens and anterior vitreous, where amplitudes of up to 100 atm were measured with a 6-mm or larger ablation zone. Posterior to this focus, the stress wave amplitudes rapidly decrease to less than 10 atm at the retinal site. Small diameter excimer laser spots (< or =1.5 mm) produce a declining stress wave with no pressure focus at the lens and anterior vitreous. CONCLUSIONS: Stress waves may be potentially hazardous to anterior structures of the human eye, including the corneal endothelium, lens and anterior vitreous face. They peak at the lens and vitreous with a broad beam, but not with small spot laser ablation. At posterior retinal and subretinal structures, they may be considered harmless. PRK and LASIK--their potential risk of cataractogenesis: lipid peroxidation changes in the aqueous humor and crystalline lens of rabbits. Wachtlin J, Blasig IE, Schrunder S, Langenbeck K, Hoffmann F.
Department of Ophthalmology, Free University of Berlin, Germany. PURPOSE: There are insufficient data on the possible cataractogenic side effects of excimer laser corneal surgery. Higher malondialdehyde (MDA) levels could indicate oxidative events related to the cataractogenic process. We therefore examined MDA levels after refractive laser surgery. METHODS: Six white Russian rabbits received laser in situ keratomileusis (LASIK) (Schwind keratome) in the right eye and a 250-microm-deep microkeratome cut (Schwind microkeratome) in the left eye. Six others underwent photorefractive keratectomy (PRK) in the right eye; the left eye remained untreated. The 180 mJ/cm2 fluence applied at a rate of 10 Hz with an optical zone diameter of 5 mm in all rabbits (438 pulses) resulted in an estimated central photoablation depth of 116 microm. Two weeks later, lenses and aqueous were taken immediately after death. MDA was detected in aqueous and homogenate of lenses after reacting with thiobarbituric acid (TBA). MDA bound to TBA (MDA-TBA) was specifically analyzed by high-performance liquid chromatography (HPLC) (excitation, 525 nm; emission, 551 nm) using phosphate-buffered methanol as eluent. RESULTS: No significant laser-induced MDA alteration was found in either the aqueous or the lens. The microkeratome group, however, had two to three times higher MDA levels in the lenses than the control group (p = 0.12) or the PRK (p = 0.03) group. CONCLUSION: Elevation of MDA in the lens of the microkeratome group indicates that LASIK, but not PRK, may be a risk factor in cataractogenesis. The increased MDA levels in the LASIK group are probably caused by the microkeratome incision rather than the secondary radiation of the excimer laser. Postoperative inflammation may explain the surprising results. ArF 193 nm excimer laser corneal surgery as a possible risk factor in cataractogenesis. Costagliola C, Balestrieri P, Fioretti F, Frunzio S, Rinaldi M, Scibelli G, Sebastiani A, Rinaldi E.
Eye Clinic, 1st School of Medicine, Federico II University, Naples, Italy. It was evaluated whether ArF 193 nm excimer laser corneal surgery represents a risk factor in cataractogenesis. For this purpose, 20 male albino rabbits underwent a photorefractive keratectomy and biochemical analyses on aqueous humour (hydrogen peroxide, ascorbic acid, and reduced and oxidized glutathione) and on lens (malondialdehyde, reduced and oxidized glutathione) were performed. In the aqueous humour of all treated animals a significant increase in hydrogen peroxide and in oxidized glutathione and a concomitant decrease in ascorbic acid and reduced glutathione concentration were observed. Moreover, all these variations were significantly correlated with the cumulative UV dose used. In the lens, after excimer laser corneal surgery, there was a dramatic loss of reduced glutathione and a parallel increase in oxidized glutathione levels. Malondialdehyde concentration was also increased, but only at the highest UV exposure. Moreover, all these variations were significantly correlated with the cumulative UV dose used. These findings demonstrate that the exposure of aqueous humour and lens to the secondary radiation generated after ArF 193 nm excimer laser corneal photoablative keratectomy induces biochemical modifications which are known to be markers of cataractogenesis. From the full text: "So, before the large-scale introduction of such surgical procedure, further studies are required to verify whether the defense systems are able to prevent the occurrence of lens damage." Books ArF-excimer laser-induced secondary radiation in photoablation of biological tissue. Lubatschowski H, Kermani O, Otten C, Haller A, Schmiedt KC, Ertmer W. Institut fur Angewandte Physik, Universitat Bonn, Germany. Secondary radiation, emitted during and after the irradiation of corneal, dermal, and dental tissue by an ArF-excimer laser (193 nm), was qualitatively and quantitatively characterized. Emission of secondary radiation was found in the range of 200-800 nm. The intensity of secondary radiation in the range of 200-315 nm (UVC and UVB) is approximately 20% of the total intensity at high laser fluences (> 2 J/cm2), and approximately 50% at moderate laser fluences ( 5 J/cm2) are required. As a consequence, laser-induced plasma formation can be observed. Secondary radiation can be used as a visible guide for selective removal of carious altered tissue. The data we have found might be of assistance in estimating potential hazards for future mutagenic studies in the field. [193 nm Excimer laser photoablation of the cornea. Spectrum and transmission behavior of secondary irradiation]. Lubatschowski H, Kermani O. Institut fur Angewandte Physik, Universitat Bonn. In order to estimate the photomutagenic and phototoxic potential involved we analyzed the spectrum and intensity of secondary radiation induced with a 193 nm excimer laser in photoablation of corneal tissue. The spectrum of secondary radiation was analyzed by an optical multichannel analyzer. A pyroelectrical detector was used to evaluate the energy of the secondary radiation. We found the secondary radiation to be in the range of ultraviolet to infrared. The spectrum has a relatively high quantity (20%) of radiation between 240 and 280 nm. The intensity of the secondary radiation depends on the energy fluence of the primary laser pulse and can reach a quantum yield of up to 10(-3) (at 800 mJ/cm2). At a fluence of 230 mJ/cm2 (193 nm), the secondary radiation in the range of 240-280 nm is approximately 5 microJ/cm2. Radiation below 300 nm was not transmitted through the cornea. Since the high genetic activity of UV radiation in the range from 240-280 nm is well known, evaluation of the potential mutagenicity of 193 nm excimer laser radiation should take into consideration the presence of secondary radiation in this problematic spectral range. However, there is no incidence known for specific UV-induced corneal cancers, which supports the argument that the potential mutgenic risk of clinical excimer laser application can be considered to be low. Because of the full corneal absorption of radiation below 300 nm, there is no risk known for pigmented intraocular structures. [Induction of chromosome aberrations in human lymphocytes as a model for evaluating the mutagenic effect of excimer laser irradiation in ophthalmology]. Forster W, Emmerich KH, Busse H, Scheid W, Weber J, Traut H. Universitats-Augenklinik, Munster, Bundesrepublik Deutschland. A model for testing the mutagenicity of excimer laser radiation in ophthalmology is presented. In contrast to other studies using cell monolayers, in our study with this model human peripheral lymphocytes (heparinized whole blood) are exposed to laser irradiation at different conditions. The possible mutagenicity of secondary radiation after exposure of the cornea is also considered. The heparinized blood is either injected into the anterior chamber of an enucleated bovine eye or filled into a quartz chamber (positive control). After irradiation the lymphocytes are stimulated and fixed during metaphase, after which the metaphases are scored for chromatid and chromosome aberrations. In the positive control group, exposure to 248 nm excimer laser radiation (500 J, 277 mJ/cm2, 10 and 20 Hz) was followed by a highly significant increase in the yield of chromatid aberrations (chromatid breaks and achromatic lesions). Side effects in excimer corneal surgery. DNA damage as a result of 193 nm excimer laser radiation. Seiler T, Bende T, Winckler K, Wollensak J. Universitatsaugenklinik im Klinikum Charlottenburg, Berlin. UV radiation is known to cause actinic damage to the DNA. Excimer laser light, possibly used for keratorefractive surgery, should not produce this damage, as the penetration depth is far less than the diameter of a cell. However, photoreactivation experiments with yeast cells show a significant amount of DNA repair after excimer irradiation. The zone of influence of a small slitlike exposure has a diameter of 2 cm. Consequently, the limbus, the critical location of epithelial neoplasia, always lies within the sphere of actinic damage. Radiation damage is induced by secondary radiation rather than by direct interaction.